Kilmarnock manager Kenny Shiels fears that teenage striker Matthew Kennedy has left the club too soon. Kennedy, 17, had been linked with a number of clubs before joining Everton on transfer deadline day for a six-figure sum. "I really would've liked him to stay to get some more proper development," Shiels told BBC Scotland's Sportscene. "Hopefully, he'll succeed; I really want the boy to do well." The Ayrshire club had previously rejected a series of offers before Everton matched their valuation of the player. Shiels hoped that Everton would not increase their offer for the forward who made his debut last year and amassed 14 appearances for the Rugby Park side. 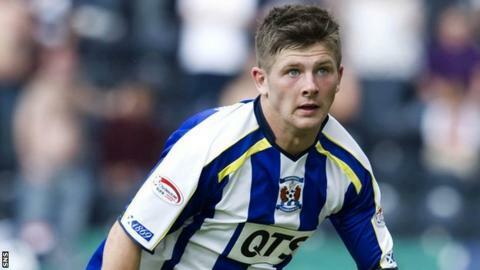 And the Kilmarnock boss said he was concerned whether Kennedy was ready for the "rigours" of the English Premier League. "Having had two years experience behind him would be ideal," said Shiels. "If you draw parallels and make comparisons of all the players that have gone down to the English Premier League, 95% of them have had a spell in the SPL first. "Steven Fletcher, Gary Caldwell, the two lads at Hamilton and Steven Naismith: they've all served their apprenticeships in the SPL. "Then it's down to the maturity of each individual. I feel that, the type of boy Matthew is, I really would've liked him to stay to get some more proper development here in a development programme, rather than thrown in to the rigours of the English Premier League. "I really want the boy to do well. That's important to me."